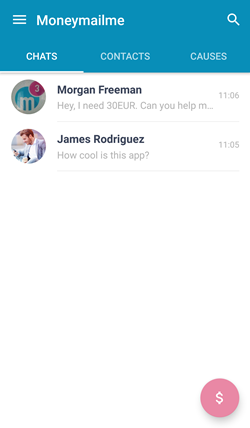 The Chats section displays all active conversations with other Moneymailme users. Tip: In order to delete a conversation, hold finger on it and in the opened list of actions, choose Delete conversation. In order to block a user, hold finger on it and in the opened list of actions, choose Block. 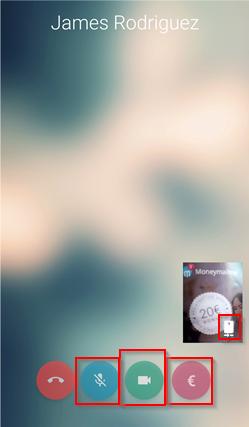 That user will not be able to contact you in any way through Moneymailme application. Blocking the user will remove the conversation from the Chats list. Unblocking the user will restore communication. In order to unblock a user, see section Settings. 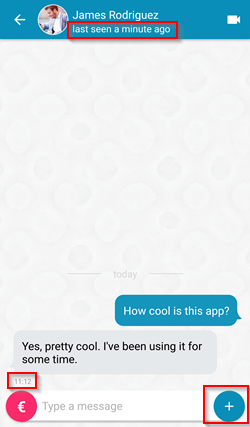 Upon choosing a conversation, the messaging window with your contact is opened. You will be able to send instant messages to your friend, but also share photos or videos from your Gallery, your current Location or a contact from your Agenda. You will also be able to see the status of your contact: online or last seen on ... at HH:MM. 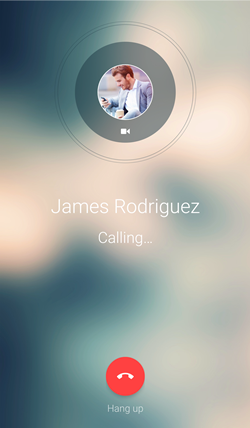 You are also able to place a video call with your contact by pressing on the video camera image on the upper right side of the screen. There are several features that you can use during a video call: you can send / request e-money, you can switch from front camera to back camera, you can turn off camera and you can turn off your microphone. 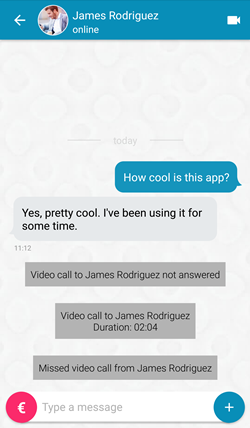 All details of your video calls are visible in the chat screen. In order to see how to send or request e-money to/from a contact, see Send / Request e-money section. Tip: In order to delete a message from the conversation, hold finger on the message and in the opened list of actions, choose Delete. Note that it will not delete the message from the recipient phone. Tip: Pressing on a message from the conversation will display the hour when it was sent (HH:MM).